Everyone who has ever wondered “why are my armpits so dark?” knows the discomfort of living with underarm darkness and discoloration. You want to wear a certain top but stop yourself for fear of exposing your underarms. You habitually stop yourself from raising your arms in case anyone may catch of glimpse of your darkened armpits. You avoid wearing tank tops at all costs. Yup, darkened armpits may not seem like a big deal since it happens to a fairly private part of your body, but dark pits can actually have a drastic impact on your life, determining everything from your clothing choices to the range of movement you display. Not to mention the waves of envy you get when you see women in billboards and magazines with underarms that are as flawless as a baby bottom’s. But guess what? Once you know what causes dark armpits – and what you can do to avoid and then lighten the darkness – you can get your underarms back to what nature originally gave you: smooth, even, light perfection. There are a bunch of reasons why you may have dark underarms and there are just as many ways to combat it. Here are some of the most common reasons why your armpits are dark as well as the best methods to lighten them and keep them smooth, even and clear. Unlike everything else on this list, acanthosis nigricans is a medical condition. It’s most commonly found in people with insulin disorders and is caused by the fact that too much insulin overstimulates skin cells, leading to thickening and darkening of the skin in certain areas, including the underarms. Areas of the skin affected with acanthosis nigricans tend to feel velvety and are dark gray or brown in color. Diabetes and insulin resistance are two major causes of acanthosis nigricans. But it can also be found in people with Addisons disease, pituitary problems, hypothyroidism, or those using oral contraceptives, cholesterol medications with nicotinic acid, and undergoing hormone therapy. How do you get rid of dark armpits from acanthosis nigricans? If you feel you may have this condition it is best to consult with a doctor to find out ways you can control it. ‘Cause the first thing you’ll have to do is treat the underlying hormonal condition that’s causing acanthosis nigricans in the first place. If its diabetes, the diabetes must be treated first. If its hypothyroidism, that must be addressed first. By righting the hormonal disorder, the dark patches will stop forming and then you can use underarm lightening treatments to speed up the process. Shaving is one of the most basic culprits of dark underarms. Just the way it works can create the illusion of darkness: for example, shaving cuts only the hairs at the surface of the skin thus giving your underarms a dark appearance. If you have hair that is darker than your skin color, the stubble will show up as a dark stain. But it’s not just the not-close-enough shave that makes your armpits look darker – consistent shaving comes with a whole other set of problems like razor burn and ingrown hairs, both of which can result in irritation, infection and discoloration. Damaged hair follicles, of course, are more prone to hyperpigmentation, resulting in dark spots under the armpits. And it’s not just shaving, either – waxing, threading and plucking can all cause irritation that results in discoloration. How do you get rid of dark armpits from shaving? The best way is to stop shaving or using whatever hair removal method is causing you to repeatedly suffer irritation like razor burn and ingrown hairs. Instead, explore other options of hair removal that don’t cause as much irritation for your skin. There are so many choices available now in the hair removal department that don’t result in ingrown hairs at all – from at home laser hair removal systems to professional electrolysis. Yup, the very same thing you count on everyday to save you from embarrassing body odors and underarm sweat patches can be the cause behind underarm discoloration. It’s simply because underarm skin is especially vulnerable to chemicals and certain ingredients may disagree with your skin, causing damage that leads to infection. 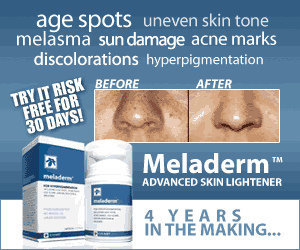 And anything that causes irritation and infection can cause increased production of melanin and discoloration. How do you get rid of dark armpits from shaving? The easiest option is to minimize the use of deodorants, which you can do by opting for natural body mists. Another good, long term option is to swap your normal deo for an all-natural option that’s free of gunk like parabens, aluminum, artificial fragrance and other irritants. Another brilliant option? Use a skin lightening product like Chromabright to lighten the dark skin on your pits – it contains natural exfoliants to prevent against ingrown hairs and other sources of irritation that cause armpit darkening. Excessive friction in the underarm area can also cause darkening. Keep in mind that, as a rule, anything that traumatizes the skin has the potential to darken it. That’s because trauma or irritation triggers your melanocytes – the cells that carry melanin – and once stimulated, these melanocytes grow bigger, causing your skin to become darker. Sweat and other wetness also increases friction and worsens the darkening effect. How do you get rid of dark armpits from friction? As weird as it sounds, take the time to give your armpits some light and space throughout the day, especially if you’re used to wearing very tight tops that don’t allow much underarm breathing room. Just being conscious of regularly allowing in airflow to your underarm region can make a huge difference. Because of hormonal changes in the body, pregnant women can fall prey to hyper pigmentation and discoloration that can darken the armpits – as well as other parts of the body. How do you get rid of dark armpits from pregnancy? There’s not too much that can be done about this but the good news is that after pregnancy, the armpits normally return to their natural state gradually. A recent – and alarming – study found that there are at least 18 different types of bacteria that live in around 20 different skin habitats. The armpits are one of their favorite habitats since darker, wetter places make lovely homes for bacteria. Keep in mind that the underarm area is pretty “undercover” – most of the time, it doesn’t see the light of day. That creates a ripe environment for stuff to fester. Bacteria can go mostly unnoticed but when you sweat, the bug becomes alive and can cause unpleasant effects such as odor and discoloration which can turn into even more serious infections without proper care, causing conditions like erythrasma, a chronic infection in the deeper layers of the skin. The skin of the underarms can then turn into reddish or scaly shades that eventually turn into dark or brown patches. How do you get rid of dark armpits from bacterial infections? The first thing you need to do is see a doctor for a proper diagnosis since the treatment will depend on what skin condition you actually have. Bacterial skin conditions will most likely require a course of either topical or oral antibiotics. In case you needed another reason to quit – here’s a huge one. Smoker’s melanosis is exactly what it sounds like: a condition that results from tobacco smoking leading to hyper pigmentation in areas such as the armpits. Dark patches linger so long as smoking continues and normally disappears gradually once you quit. How do you get rid of dark armpits from smoker’s melanosis? Quitting smoking is the first step and yes, we know it’s a lot easier said than done. But then again, these days there are so many options for those who want to quit (I know, I’m a former smoker as well). If you haven’t yet, look into harm reduction options like vaping – it’s sort of like smoking but without the smelly, discoloration side effects.